22 September 2012 will be an opportunity to find another way for just one day to get around town, leave the car at home and walk, take a bus, train or cycle around town. All this is to help highlight the pollution caused by cars, not just the fumes but the whole cycle of waste and disruption, the noise, delayed journeys, the whole human misery caused by traffic congestion and car pollution. Almost 40% of the transport sector's CO2 emissions are produced by the use of private cars in cities. It's not just the exhaust fumes, but the car itself, old batteries, tyres, oil, and of course the car itself once it fails the MOT test and goes to the scrap yard. More information about this international car free campaign is now hard to find as most Governments start avoiding the issue. 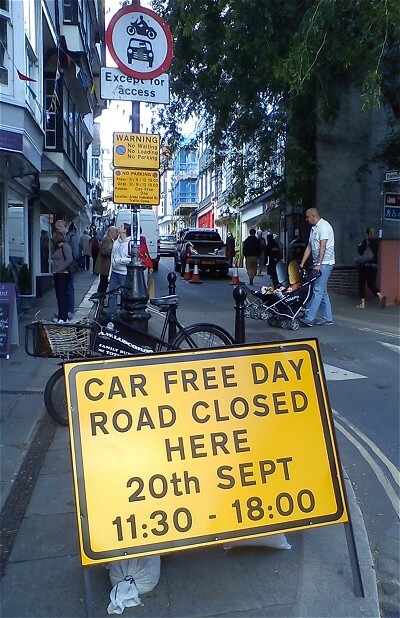 Car free day was part of global events on sustainable mobility that ran from the 16th to the 22nd September. If you can avoid using your car on the 22nd September, even for just one journey you will be helping reduce pollution in your area and showing the world you care! Who knows you might even save a little money and enjoy the change of pace. So become one of the "In town, without my car!" people on Wednesday 22 September 2012. If you use your car, try asking neighbours about a shared journey - just for that day - shopping trip, to work, school run etc etc.